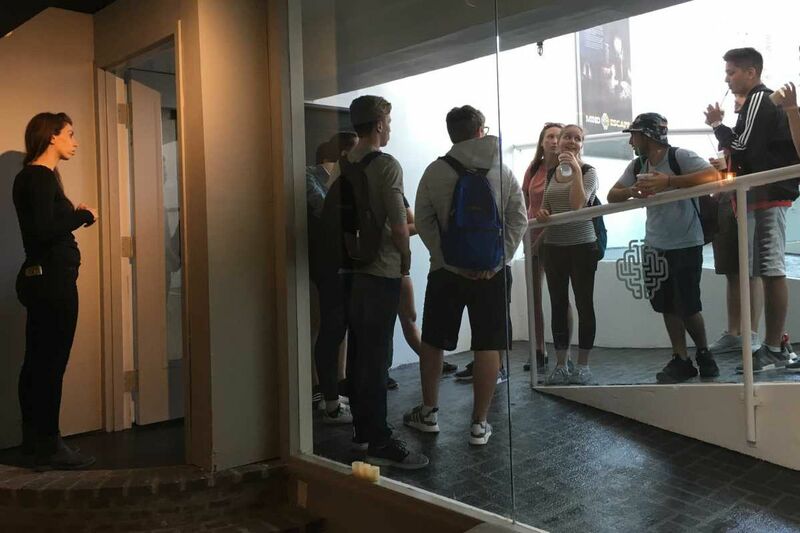 Mindescape co-founder Vered Bakshtein greets high school seniors from Montreal at her new escape room on 4th Street near South. The office building is about to be demolished, with you trapped inside. A plague-infected zombie keeps tugging at its chains, inching ever closer. You're trapped in the 1980s with bad hair and Reagan-era movies. A murderous magician is threatening to make you disappear! While nightmares to some, these time-bomb-ticking scenarios are also driving the adrenaline-pumping, brain-teasing fun to be found in escape rooms, a form of participatory group entertainment that resembles a video game brought to life. Escape rooms offer a fun outing as well as salutary effects, working those brain cells while nudging you to cooperate to achieve a common goal. "Delegating responsibilities is key to solving the mysteries, to breaking out of the room in the hour you're given," noted Evan Lazarus, a 41-year-old financial analyst who studied up on how to do well before his first visit (to the Amazing Escape Room at 101 N. 15th St.) five weeks ago with his wife and three other couples. "We were in the ideal number range" (eight to 10 people) "to take on an escape adventure all by ourselves. Otherwise you're thrown in with strangers and first have to figure out each other's strengths. This escape room" (one of Philly's oldest) "was nothing much to look at, but the experience was great. Now we're anxious and ready to do another." And that's great news for escape game entrepreneurs, who often fund and build (and sometimes design) the projects. They stand to make big bucks if the fad doesn't fade, as they charge a hefty $28 to $32 a visitor. A global phenomenon spawned in Japan in 2007; escape rooms then spread through Europe and the Middle East. While the States and Philly have been latecomers to the party, there are still thought to be well over 3,000 rooms nationally. The first frill-free escape rooms opened here three years ago. They were in low-rent settings "that didn't disguise their roots as office and warehouse space, were sparsely furnished with folding tables and chairs, and got by with clues on pieces of paper and lock boxes that players had to open to get more clues and maybe a key," noted New York-based multicity escape game developer Brad Albright. "I know of early-in players who were afraid to touch the walls for fear of catching something ... not in the plot line." Now a much posher, better executed "second wave" of escape adventures is on the rise, running amok here and elsewhere. Two months ago, Liberty Escape Rooms took "the first historically accurate games in a historically certified building" to 325 Cherry St. in Old City – just "steps" from the Liberty Bell. The brothers Justice and Josh Voltz and partner Josh Mauchly, who developed it – with a mash-up of historical factoids, decor, and "hidden" high-tech tricks – have been doing so well that they're now pressing to open more escape rooms on the Ocean City boardwalk by Memorial Day. Just last week, MindEscape flung open its first of two rooms in a high-traffic location at 521 S. Fourth St. near South. It boasts a stuck-inside-Bangkok-prison plot line (never should have smoked that joint!) designed for South Street hipsters and international tourists alike. "You don't have to understand English to pick up and work with our clues," said codeveloper and Game Master Vered Bakshtein. "V," as she's called, first became a devotee of the mystery-solving, bust-out entertainment concept "at home in Israel, where it's hugely popular. We have more than 100 in a country the size of New Jersey." Escape rooms are hot, she believes, because "people crave to get out, to put away their cellphones, solve riddles, have fun, and just communicate with one another." Now, this weekend, Harrisburg native Albright and his Escape Entertainment partners, including Bucks County-raised Jim Grass, are jumping into the local scene with a party-ready, four-escape-room set-up on the fifth floor at 1218 Chestnut St. It offers a "new level of polish and professionalism," claims Grass. Building on their recent projects in New York and London, they're offering "the largest and most comfortable lobby and event space for small and large groups," plus immersive multimedia rooms designed by a seasoned Broadway and TV set design firm (John Creech). Add in behaviorist-tweaked clues and puzzles to bring out the best (or worst) instincts of players. There's even a conference room for post-game analysis of a team's performance. One Escape Entertainment room has a time-warp scenario requiring gamers to travel back to colonial times and deploy inventions dreamed up by Ben Franklin. Another is a Planet of the Apes-styled game, only its simians from the Philadelphia Zoo have escaped and invaded the Free Library, Franklin Field, the Kimmel Center, and Independence Hall. In truth, every escape room seems to tout "team building." The rallying cry attracts lots of company outings on weekdays/weeknights. It sure beats paintball and bowling and can turn around a grumpy bunch. "The other day, we had a group of managers barely looking at each other when they arrived, but then joking and hugging and going out for drinks at the end," said "V."
Team-building bookings are "where the money is," said Justice Voltz of Liberty Escape Rooms, where the signature escape game demands outsmarting British spies and deciphering codes developed by George Washington and Thomas Jefferson in Revolutionary times. Liberty Escape Rooms also offers the WWII-themed "Blitzkrieg." Another key to success, said creators, is getting along well with other escape room developers and not giving away too much about your projects – such as how the room looks or runs. While lots of folks are converted to the pursuit after playing a room, there's no point in their doing the same place again. So it's good practice to recommend competitors' rooms they'll like. While just 10 months in business, the four-room Escape Room Mystery in a surprisingly apt King of Prussia warehouse (840 First Ave.) has already hosted "more than 100 full-facility rentals, including tons of groups from Vanguard," said Noel Keen, codeveloper with her husband, Brian. A former engineer for Volvo (heavy machinery) in Shippensburg, Pa., "Brian put all kinds of hidden tech tricks into our rooms," Noel said, which include a mad scientist-themed "laboratory," an archaeologically minded "Egyptian Tomb," and an eccentric gamer's lair called "The Billionaire's Den." And yes, they're reaching out to the local tourist crowd, too, with the British-are-coming themed "Revolutionary Spies." So what's it cost to put together an escape room? "We were lucky. We started out with bare space, so there was no demolition work to do," Noel Keen said. "And we were able to do a lot of the non-code work ourselves. We still put about $20,000 into each of the four rooms." And how are they doing? "We're sold out four weeks ahead on Saturdays, getting there on Fridays and Sundays, and doing well with groups on weekdays, even with a close-by competitor and another in Conshohocken."